Built for its software lab in India, the company eventually will make the technology available to clients seeking green data center power alternatives. Wanted to reiterate some news out of IBM’s India operation early in November: the company has designed a solar array for its data center in Bangalore specifically configured with the needs of servers and cooling infrastructure in mind. And, yes, the technology will eventually be available to IBM customers. A technician examines the 50-kilowatt IBM solar array in Bangalore, India. 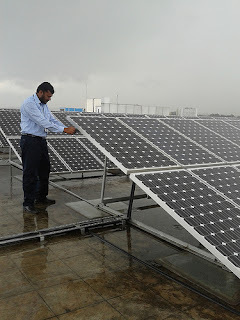 The array in India, which serves the company’s India Software Lab, takes up approximately 6,000 square feet of rooftop. It can produce up to 50 kilowatts of electricity capacity. The array can supply the site about 330 days per year, for about five hours each day. The array includes technologies that take the power conditioning needs of DC and AC servers in mind. So, not only does it help provide a renewable source of energy for the facility, but it helps reduce the energy consumption of the data center by about 10 percent compared with comparable facilities, according to IBM’s information about the new technology. So you have a sense of the magnitude of this solution, consider that it is powering an IBM Power System that providers compute power of 25 to 30 teraflops. The solar array hooks directly into the water cooling technology and high-voltage systems, IBM said. So, you could see where the technology would play a role with businesses optimizing their data centers in established locations. But probably the biggest impact could be felt in portions of the world that don’t have readily available electricity supplies. Off-the-grid data centers, so to speak.